Julio Vezub studies different sources, documents, testimonies and records to reconstruct the facts linked to the campaigns. Photo: courtesy resercher. With photographs taken by technicians and topographical engineers who accompanied the troops in 1882 and 1883, the comparison of those pictures with the same current landscapes today, cartography, army reports and letters written by Indian chiefs, Julio Vezub, CONICET associate researcher at the Patagonian National Research Center (CENPAT-CONICET), managed to build a more complete view of history, its protagonists and the events related to the campaigns. Vezub states that the different types of sources contribute to have a more everyday dimension about the clashes and the social experience the war meant on a network of existing relationships. “The movements on the territory were successful for the army due to the fact that they combined the repression with the subordination of the mediators and indigenous leaders who facilitated the advance and access of national troops in a context of violence never experienced before. This reality questions the idea of the conquest as a unique event like a Napoleonic campaign, and provides a more fragmentary perspective of a series of military events that took place before and after the expeditions led by Roca”, he says. 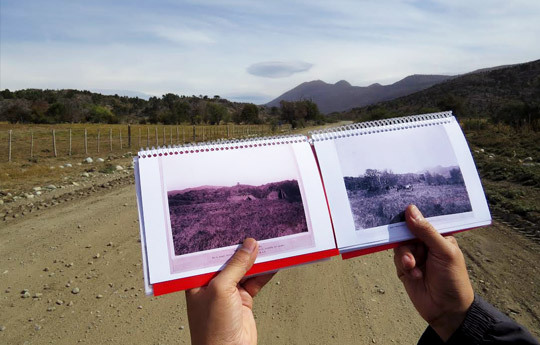 The photos taken in 1882 and 1883 by engineers Carlos Encina and Edgardo Moreno in the context of the military campaigns were contrasted with the current spots where they were taken in order to understand the modifications in the configuration of the landscapes, the environmental changes, the social uses of the land, the resources and types of exploitations. Following the orders of Argentine President Julio Argentino Roca, Encina and Moreno undertook a scientific expedition and entered at what was called “Territorio del Triángulo” [territory of the triangle], delimited by the rivers Neuquén and Limay and the Andes. They took photos, measured the land and participated in the social space meant to be controlled. Besides, they published the album “Photo views of the National Territories of rivers Limay and Neuquén”. More than a century later, and with that document in his hands, Vezub went to Neuquén and scoured the same routes and paths the engineers took to understand the logic behind the clashes at that time. “Encina and Moreno rode with the troops. They had to recognize the territory for their following measurement and the transfer of that land to a system of private property. They did not advance to any place or take any path. The members of the expedition did not venture into the unknown. They went to places where they knew there was going to be water and pastures. It was a war for the resources, the capture and control of the populations and cattle”, the historian explains. Some sources allows for more knowledge on different social actors that have neither been completely represented in the traditional books about the conquest nor on the reports of the campaign written by the army officers. The photos, for instance, that portrayed the presence of women in the forts as well as in the Indian camps. The letters written by the chiefs recreate the important role of the indigenous mediators. The indigenous commanders had their small bureaucratic lawyers to communicate with other chiefs, other Hispanic native authorities to do business or make different types of political agreements. The letter was a medium to promote the relationships and the economic and political sociability decades before those military campaigns. Mediators and guides appear in military reports as non important characters but the letters highlight their role. “These people knew not only the resources and the landscape but also the social protocols that had to be respected, the tolls, gift policies and welcomings. The occupation of the national territory of Neuquén, for instance, would have lasted much more time if it had not been for their contributions”, the historian explains. The new knowledge resulting from the combination of different sources reveals the need for further studies on the so-called “conquest of the desert”. For Vezub, “this historical decline could be related to the fact that the last military dictatorship and the nationalist historiography has appropriated this last event as its own symbolic capital and that hindered any profound reflection on the process as well as its repudiation”.